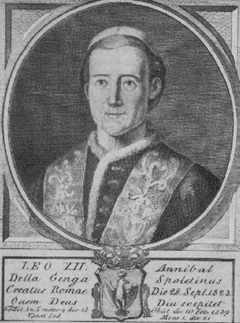 Leo XII, pope from 1823 to 1829, was born Annibale della Genga of a noble family, near Spoleto, on the 22nd of August 1760. Educated at the Accademia dei Nobili ecclesiastici at Rome, he was ordained priest in 1783, and in 1790 attracted favorable attention by a tactful sermon commemorative of the emperor Joseph II. In 1792 Pope Pius VI made him his private secretary, in 1793 creating him titular archbishop of Tyre and despatching him to Lucerne as nuncio. In 1794 he was transferred to the nunciature at Cologne, but owing to the war had to make his residence in Augsburg. During the dozen or more years he spent in Germany he was entrusted with several honorable and difficult missions, which brought him into contact with the courts of Dresden, Vienna, Munich and Württemberg, as well as with Napoleon. It is, however, charged at one time during this period that his finances were disordered, and his private life not above suspicion. After the abolition of the States of the Church, he was treated by the French as a state prisoner, and lived for some years at the abbey of Monticelli, solacing himself with music and with bird-shooting, pastimes which he did not eschew even after his election as pope. In 1814 he was chosen to carry the pope's congratulations to Louis XVIII; in 1816 he was created cardinal-priest of Santa Maria Maggiore, and appointed to the see of Sinigaglia, which he resigned in 1818. In 1820 Pope Pius VII gave him the distinguished post of cardinal vicar. In the conclave of 1823, in spite of the active opposition of France, he was elected pope by the zelanti on the 28th of September. His election had been facilitated because he was thought to be on the edge of the grave; but he unexpectedly rallied. His foreign policy, entrusted at first to Della Somaglia and then to the more able Bernetti, moved in general along lines laid down by Consalvi; and he negotiated certain concordats very advantageous to the papacy. Personally most frugal, Leo reduced taxes, made justice less costly, and was able to find money for certain public improvements; yet he left the finances more confused than he had found them, and even the elaborate jubilee of 1825 did not really mend matters. His domestic policy was one of extreme reaction. He condemned the Bible societies, and under Jesuit influence reorganized the educational system. Severe ghetto laws led many of the Jews to emigrate. He hunted down the Carbonari and the Freemasons; he took the strongest measures against political agitation in theaters. A well-nigh ubiquitous system of espionage, perhaps most fruitful when directed against official corruption, sapped the foundations of public confidence. Leo, temperamentally stern, hard-working in spite of bodily infirmity, died at Rome on the 10th of February 1829. The news was received by the populace with unconcealed joy. He was succeeded by Pope Pius VIII.